I remember the Church of the Nativity as being very dark and very cold. Badly needed repairs were underway and so scaffolding had been erected throughout the nave, around the columns, beneath the ceiling, and covering the windows. Safety tape limited where one could walk through the shadowy interior. Some piece must have been missing because it was just as cold inside the church as it was outside on that March morning. Portable heaters had been placed amid a section of chairs for worshipers on the main altar but they were off for the time being. Once I came to terms with this dim, chilly, and somewhat chaotic church, I started looking for traces of its history and its holy places. 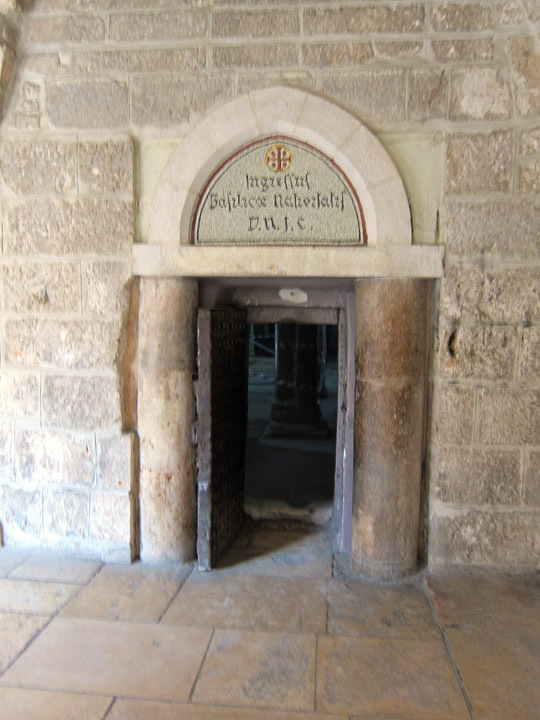 Early Christians traditional identified a cave in Bethlehem as the birthplace of Jesus and so Constantine build the first octagonal-shaped church over this site in the 4th century. 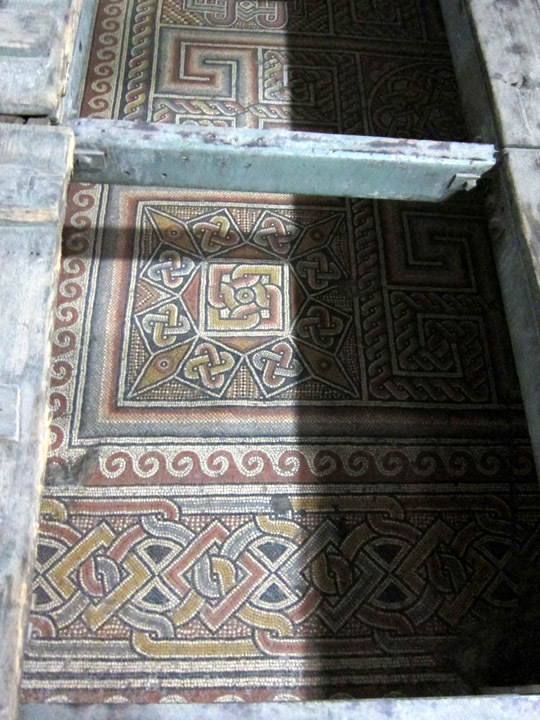 You can still see remnants of the beautiful, original floor mosaics. The current Church is a classic Byzantine basilica design and dates to the 6th century. 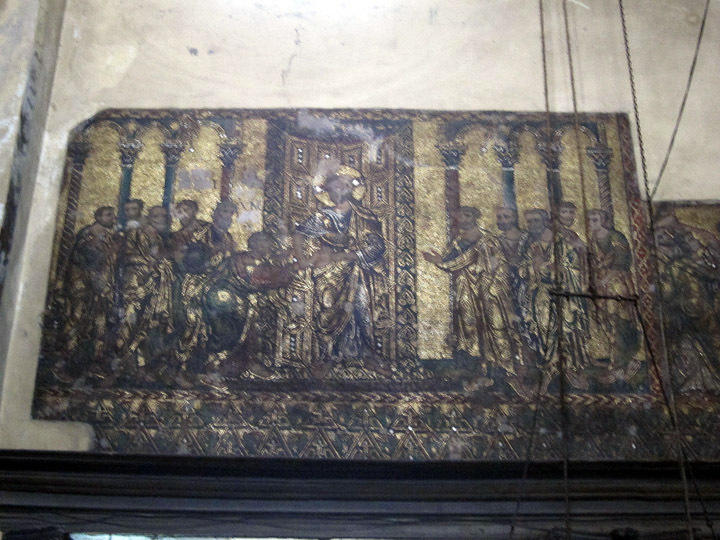 An uncovered section of the original 4th century mosaic flooring. In the 7th century, Persians invaders chose not to destroy the building because according to legend, they enjoyed the depiction of Persian magi in the Nativity art. In the following centuries, the church’s nave served as a mosque. Over the 10th to 12th centuries, European crusaders crowned their King in the Church and renovated the interior adding mosaics along the upper walls which partially survive today. While hard to see, this is a portion of the 12th century wall mosaics along the upper register of the nave. During the Ottoman period, much of the interior marble was looted and used to construct other buildings in the region. In fact to stop looters, the Ottoman ruler had the doors narrowed to prevent cartloads of material from being transported out but this only succeeded in slowing the process. Because of exterior construction, I entered through this side door which had also been narrowed. In the 19th century the Greek Orthodox, Armenian Orthodox and Roman Catholic Churches took custody of the church. They share responsibility for upkeep of the building but have sole control over sections, chapels, and walls. As a result, the decoration inside the church is odd mix of partially preserved ancient decorations and three distinct styles of relatively modern decorations. 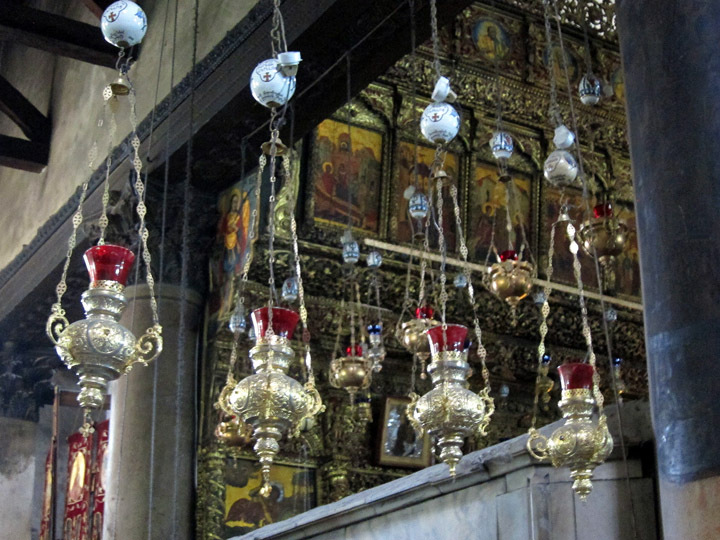 Lamps and icons in the Church of the Nativity. In the background is the upper sections of the massive iconostasis on the high altar. I really enjoyed the tangle of lamps throughout the church. Strings of one style were intermingled with sets of another style. While the church was definitely Santa Claus free, the colorful lamps, or least the impulse to hang way too many lights, reminded me in some way of colorful, modern Christmas lights. Dangling lights inside the Church of the Nativity. There are a lot more beautiful churches in the Christian world – ones with soaring architecture, magnificent coherent decorative schemes, and excellent craftsmanship and materials. However, the church as it is today, with piecemeal decorations and badly in need of restoration, makes a lot of theological sense for a church built to celebrate a stable. It is this honest display of its history and lack of pretentiousness that makes the church charming. 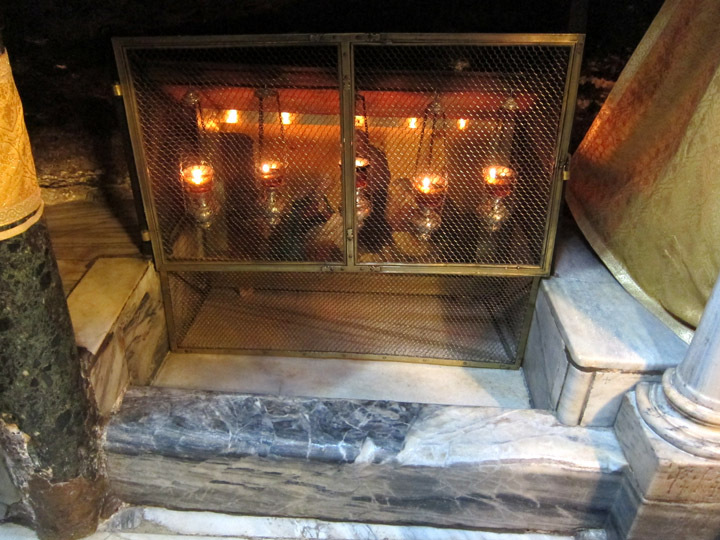 The Grotto of the Nativity underneath the high altar is incredibly small and intimate. Originally a cave, the walls are covered in decorative fabrics giving this rectangular space an even more enclosed feeling. The grotto is now illuminated with irreverently bright halogen light bulbs which seems strangely incongruous with the midnight Nativity imagery connected with this place. Assorted icons, paintings, crosses and lamps decorate the grotto, each left behind by a different time period and nationality, which gives the chapel an endearingly jumbled ascetic. The ceiling is still scarred from a 19th century fire in the Grotto which destroyed all the older decorations. Visitors crowd around the silver star in the Grotto of the Nativity. 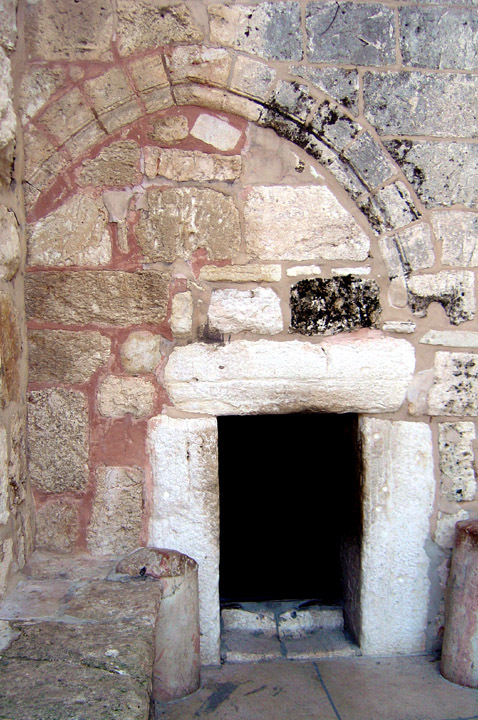 A staircase on the right brings visitors down into the Grotto between the Chapel of the Manger and the star marking the birth site. On the other side of the star is the staircase out. The Grotto is deep enough that anyone wishing to stay longer can step back into the shadows. 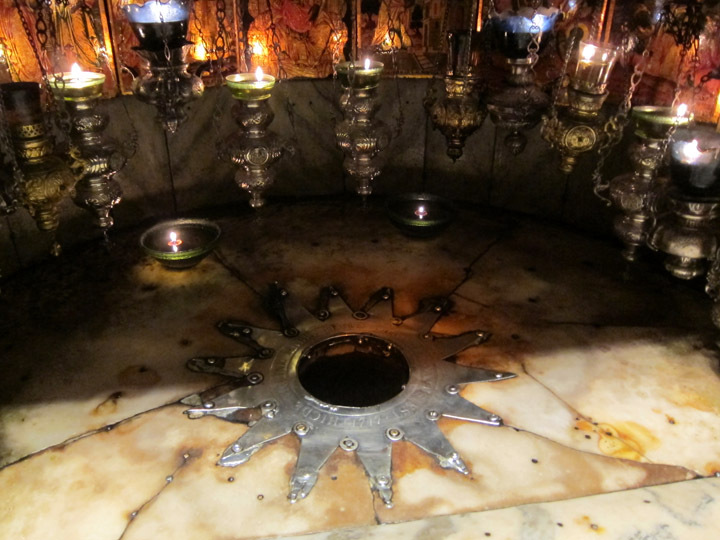 Jesus’ birth site marked with a 19th century replacement silver star – The Grotto of the Nativity. Besides being a religious marker, this star was involved in a bit of geo-political history. The star was stolen in 1846 while the French and Russians (hiding behind the pretext of Catholics and Orthodox religious interests) jostled each other and the fading Ottoman Empire to see who could get control of the Holy Lands. This religious conflict directly contributed to the Crimean War of 1853–1856. The current star is inscribed in Latin giving us an indication of who “won” which seems sadly very out of place in this holy space. The Chapel of the Manger is about 10 feet away and bounded by a marble canopy that dates to the 12th century. 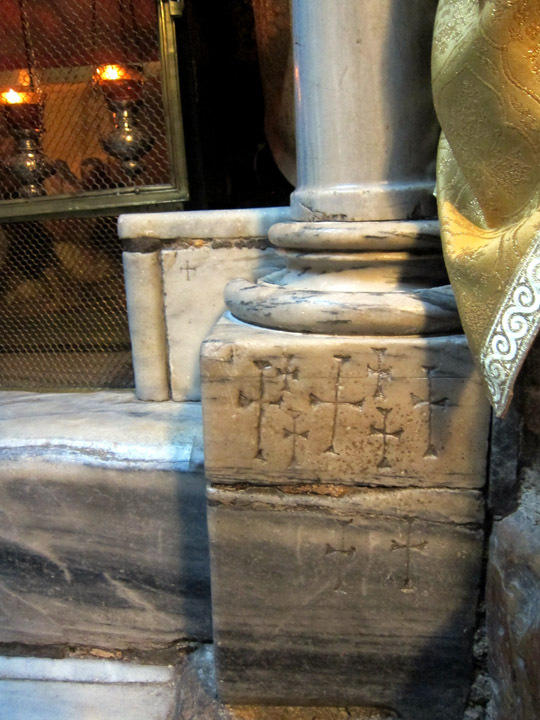 I was excited to find some cross graffiti carved into the Chapel framing. While admiring the manger site, I heard a very recognizable thick Texas accent exclaim, “Look Jeanie! Is that where they laid the Lord? !” A church group of Americans had made it down the stairs and were now gleefully taking in the birth site. I chatted briefly with them, wished them well, and stepped back as these folks filed through and departed. Behind them was a group of Ethiopians clad in white robes eager for their chance to see the Grotto. 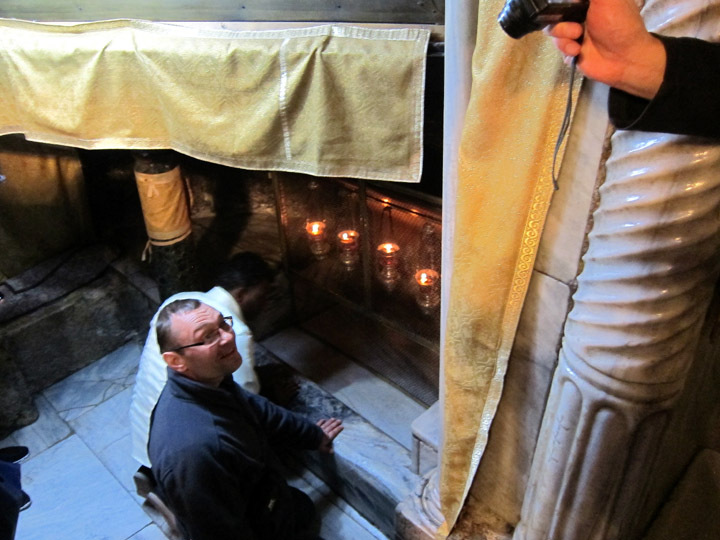 One visitor poses for a photo while another prays in the Chapel of the Manger in the Grotto of the Nativity. Having been to several Christian sites in Israel by this time, I was coming to expect and enjoy this kind of international diversity at each pilgrimage site. 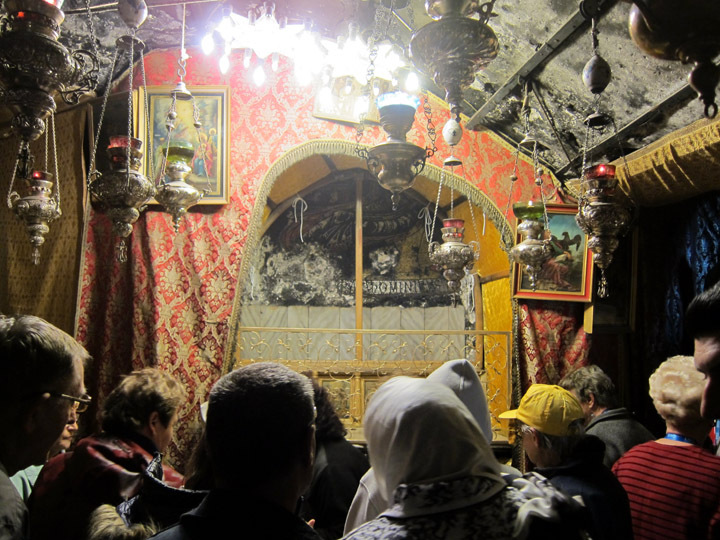 Regardless of the how they worship at home, visitors approached the Church of the Nativity humbly and reverently. Clearly people cared about this place and were happy to be there – despite the leaky roof, obtrusive construction, missing marble, and disjointed decorative arts. As an art and history traveler, I don’t intend to get into the politics of Israel and Palestine here, but I will say, don’t let the West Bank deter you. The journey across the border is a travel experience in itself and worth doing independently. There is a public bus from the Damascus Gate in Jerusalem to the border crossing. You then walk down a open tunnel into a parking lot filled with cabbies. While their eagerness can be a little overwhelming, you can negotiate a set price for a half day of sightseeing. I think we paid with tip about $45 to see 3 churches and the Banksy paintings around Bethlehem. 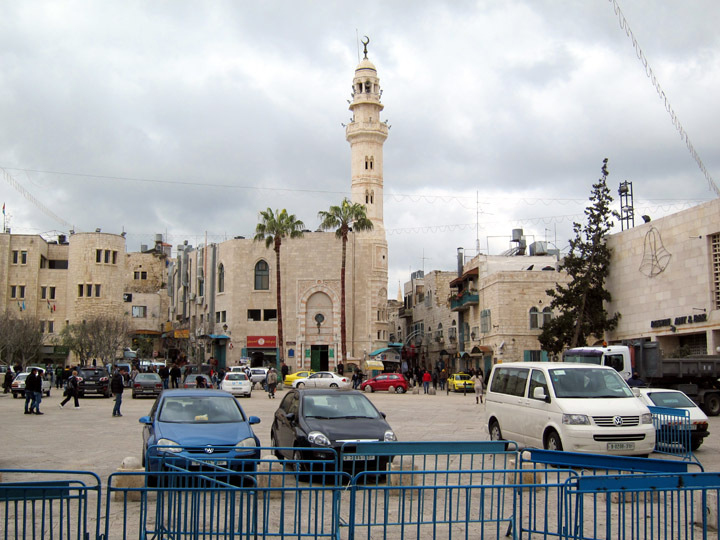 Manger Square, Bethlehem. The decorated Christmas Tree (just out of frame to the left) and the bell light on the building on the right give away that this not your average town center. 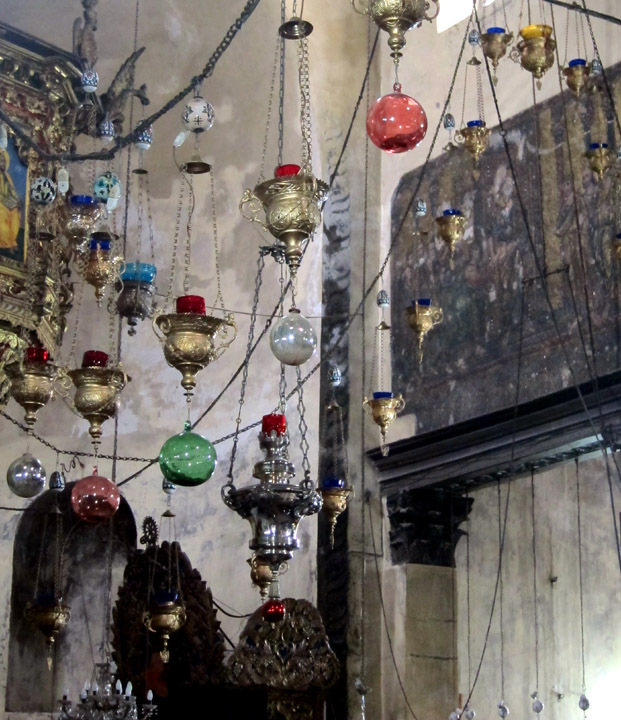 As you can imagine, most people visit the Church of the Nativity on organized group tours. They are led into the church and line up to enter the Grotto from the right side stair case. Depending on how many buses there are, this could be a long wait. The left side “exit staircase” is monitored by a security guard but if you ask, he will let small groups of 1-4 people down into the Grotto, essentially skipping the line. You’ll have to be wary of the “tour guides” hustling independent visitor outside the church (and sadly in the church itself) saying that they can get you into the Grotto faster because really anyone can just walk down into it. It’s the sort of thing you see at most major tourist attraction and I understand why they do it, but it’s disappointing when you realize what the deal is. The old and the new in the Grotto of the Nativity. I hope someday you get to visit this church for your own. But hopefully by then it will have a proper roof and lights, so that your visit will be even more enjoyable.